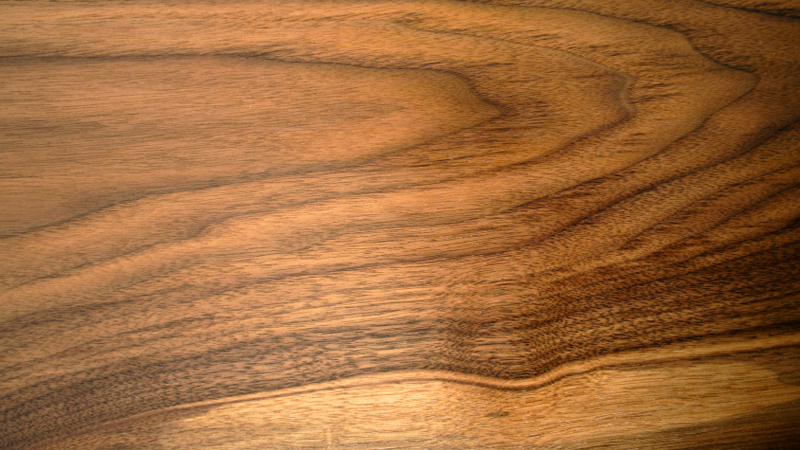 Although not widely available, English walnut is considered to be one of the most beautiful timbers. Used for high class furniture and gun stocks, the dark colouring and deep lustre of the wood make it a prized timber for prestigious applications. Together with Italian walnut, trees grown in England are among the best in the world and fine specimens are always in great demand. However, they are not grown commercially in this country and availability is generally limited to individual trees from private gardens and estates. Although highly prized, the walnut also presents a number of challenges. The tree is often knotty and the centre of the log is prone to shake (splits) so users of walnut should expect a high percentage of waste. Waney edge boards of walnut will be supplied with wane (bark) on one or two edges. Boards are often unusual shapes and sizes and rarely straight which makes their use quite complex. The sap wood is a creamy white in contrast to the heart wood which ranges in colour from grey to dark brown. The most valued walnut is that with a streaky honey-brown colouring and a wavy grain, a combination which creates a stunning three dimensional figuring. Walnut is sold in whole log volumes. We allow customers to select individual logs but we do not allow the selection of individual boards. Prices vary and will depend on the specification and quality.